Large is lovely! You will think so, when you see this 11 5/8" tall lady by Weil Ware of California. Original sticker on the back. She has a hole for use as a vase or planter on one side. 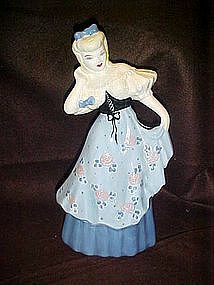 She wears a pretty blue dress with pink roses and a lace peasant style blouse. Blond hair, with pigtails and a matching bow. Roses have a relief feel to them. No chips cracks or repairs. She does have age crazing under her glaze, but I can send you more pictures if you like. She is very lovely. On the bottom the number 1725 under her glaze and the V in a circle, which was scratched in before firing and under glaze also. There appearas to be another letter circled also but can't make it out.